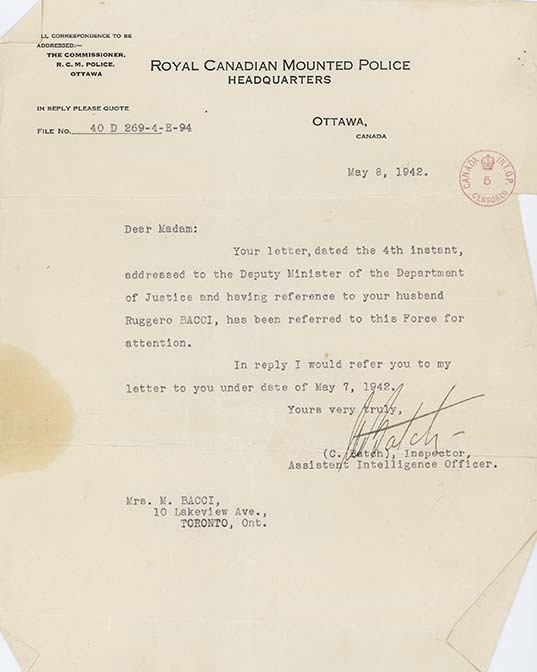 This typewritten letter from C. Batch (RCMP Inspector, Assistant Intelligence Officer), was sent to Mrs. M. Bacci, on May 8, 1942. In this letter, Batch references a letter sent by Mrs. Bacci to the Deputy Minister of Justice, which was forwarded to the RCMP. The inspector then references a letter in reply which he had already sent Mrs. Bacci the day before (see LICEA2012-0002-0078).